Ilke Tampke’s brilliant novel Skin publishes in paperback today! If you’ve already finished your copy and you’re wondering what to read next… well, wonder no more. We’ve put together a (not remotely extensive) list of historical fantasy novels, set in times from prehistory up to the sort-of-2oth century, for your reading pleasure. Some are more historical, some are more fantastical, some are YA, some are definitely not YA, and all are fabulous reads. For younger readers, or if you read some of these when you were a kid and would like to revisit them, this list is only the very tip of a wonderful iceberg. Tell us what we missed in the comments! The Island of the Blue Dolphins (1960). One of the great American children’s books, Island tells the (true) story of a young woman named Karana, who was stranded alone on an island for nearly twenty years after her tribe sails to California. It’s a wonderful, heartbreaking story of strength and survival, and will make you want a feather skirt so much. Streams to the River, River to the Sea (1986) The story of the Lewis & Clarke expedition into the American interior in the early 19th century, from the perspective of Sacagawea, the young Native American woman who accompanied them as guide and translator. She did the whole journey with her newborn baby strapped to her back. Sing Down the Moon (1970) Scott O’Dell’s heartbreaking novel about a young Navajo woman forced out of her ancestral home, the Canyon de Chelly,. Julie of the Wolves (Jean Craighead George, 1972) Another story of survival, Julie is an Inuit girl torn between her traditional and modern lives, who runs away and gets lost in the Alaskan wilderness, where she is adopted by a pack of wolves. Roll of Thunder, Hear my Cry (Mildred D. Taylor, 1976) Only one of a number of extraordinary novels about life in the American South in the 1930s, from the perspective of a nine-year-old African-American girl. Diana Wynne Jones. Where do we even start with her? Perhaps with the best known of her bibliography, Howl’s Moving Castle (1986), which tells the story of Sophie Hatter, a young woman who’s turned into an old woman and winds up involved in a rather extraordinary series of events. Clan of the Cave Bear (and the rest of the Earth’s Children series by Jean M. Auel) The first in a six-book series about Ayla, a Cro-Magnon woman raised by the Neanderthal, who strikes out on her own in a strange and terrible prehistoric world. Clan is both wonderful (she teaches herself to hunt!) and brutal (I won’t spoil it for you) but my favourite of the entire series is the second, The Valley of Horses, where she’s living entirely on her own, tames a horse and a cave lion, and eventually gets involved in some serious sexytimes. Daughter of the Red Deer (The Reindeer Hunters series by Joan Wolf) Set in prehistoric France, Daughter features a sexytimes love story against a backdrop of enormous religious change. The Grace of Kings (Ken Liu 2015). This gigantic sprawling epic has it all: political intrigue, action, adventure, gorgeous world-building, human frailty and human strength. Also the cover is one of my favourites from last year. The Crystal Cave (The Merlin Series, Mary Stewart). This evocative, magical series retells the legend of King Arthur from Merlin’s perspective. The Crystal Cave is one of my mother’s favourite books (she also gave me all the Scott O’Dells and Jean Auels, so if you like those… you should trust her taste on this, too!) and we’re just about to reissue it with a beautiful new cover. The Buried Giant (Kazuo Ishiguro, 2015). Britons live alongside Saxons; King Arthur is gone but Sir Gawain makes a cameo; war looms. The Buried Giant has proven divisive; some readers love novel’s the mix of fantasy and history; others have found it problematic. The Mists of Avalon (Marion Zimmer Bradley) I can’t bring this title up without mentioning the enormous controversy surrounding Marion Zimmer Bradley, which is forever changed the way we approach her books. 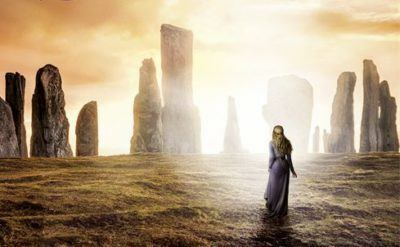 Before the story broke, The Mists of Avalon (a retelling of the Arthurian legend from the perspectives of the female characters), was one of the tentpoles of modern historical fantasy writing. It’s very hard to know how to talk about The Mists of Avalon these days; it was hugely important and influential in its day but its legacy will – and should be – forever tainted by the horrible accusations of abuse leveled against Marion Zimmer Bradley and Walter Breen. Black Trillium (Marion Zimmer Bradley, Julian May and Andre Norton, 1990). The same issue arises with Black Trillium, the first in a five-book series about three sisters who take three different roads to reclaim a kingdom. There is the intellectual sorceress (my favourite; also, sexytimes with a wizard), the feisty tomboy and the delicate hothouse flower (who is stronger than she seems). Tigana (Guy Gavriel Kay, 1990) The book that launched our own Guy Gavriel Kay into the stratosphere as one of the major fantastical historical novelists of the modern era. Tigana is a province in a land not unlike medieval Italy, and home to a number of rebels dedicated to overthrowing a pair of sorcerer tyrants. Uprooted (Naomi Novik, 2015). Enchanted (evil) forests, wizards in towers, magic, mystery, friendship, war, more evil forests… and sexytimes. This novel, set in a fantasy medieval Poland, is just heartbreakingly wonderful. I’ve already reread it twice. A Knight in Shining Armor (Jude Deveraux, 1989) I kid you not, this is one of my all-time favourite historical fantasy novels. It’s about a modern woman who accidentally calls a Tudor-era knight out of history and has to introduce him to the modern world. And then he gets pulled back in time, and she gets dragged along. Also: sexytimes. Double-bonus: it’s hilarious. Top tip: try to get hold of the original edition. The author revisited the book and added new material in 2004 and I don’t think it made much of an improvement. On Stranger Tides (Tim Powers, 1987). Ignore the mediocre Pirates of the Caribbean movie (which isn’t really based on this book at all; the first Pirates movie is actually much closer to the novel) and read this brilliant tale of bravery and skulduggery on the high seas. It’s fun, there are pirates, there are zombies, and it’s really feminist. Outlander (Diana Gabaldon, 1991). You’ve probably heard about this one by now – 1940s nurse is transported back in time to the (second) Jacobite rising (1743), where she engages in some super-duper sexytimes with a nice, hunky Scotsman named Jamie. The Blade of the Courtesans (Keiichiro Ryu, 2008). I ran across this novel as I was researching this list and it looks AMAZEBALLS: ‘a young samurai by the name of Seichiro Matsunaga, trained in swordfighting by none other than the legendary samurai Musashi Miyamoto, finds himself in Yoshiwara (the pleasure quarters of old Tokyo), per Miyamoto’s dying wishes. In Yoshiwara, Seichiro finds himself defending its denizens against what may be spies from the Yagyu Clan, including one young woman named Oshabu, whose story runs deeper than still water suggests.’ Is there magic? Are there sexytimes? I have NO IDEA. But I know what I’m reading this weekend. The House of Shattered Wings (Aliette de Boudard, 2015) It’s heaven versus hell in an alternate-history Paris – and it’s a murder mystery, to boot. Paris lies in ruins after groups of angels went to war against each other; now, hiding away in various houses, they continue to battle for control. The Amulet of Samarkand (Jonathan Stroud, 2003). Bartimaeus is a 5,000-year-old djinn, unhappily in the thrall of Nathaniel, a teenage wizard-wannabe, in a sort of late 19th/20th century London. The books (there are four!) are wonderful fun, and Bartimaeus is one of the the truly great creations of modern fantasy fiction. And he talks to the reader in asides set out in footnotes. The books are low on sexytimes but more than make up for that in total awesome. Kindred (Octavia Butler, 1979). 26-year-old Dana is inexplicably wrenched from 1976 California to pre-Civil War Maryland. This book is brutal and extraordinary. Soulless (Gail Carriger, 2004) The first in a five-book series, which has several spin-off series, about a young woman and the werewolf she falls in love with. This book, series, and world is hilarious, cute, and there are lots of sexytimes. Lots of sexytimes. Black Opera (Mary Gentle, 2012). You may not think a book about magical operas is your thing, but it is. Seriously; the book itself is structured like an opera, contains all the elements of opera (except actual people actually singing at you) and yet is a book about operas. And so much more. Jonathan Strange & Mr Norrell (Susanna Clarke, 2004) Are there sexytimes? No. Is there everything else? Yes, yes and yes. This is a huge, wonderful book. Let’s all go read it again. Redemption in Indio. (Karen Lord, 2010). This lovely, charming little novel will make you want a chaos stick like you’ve never wanted anything before. 8 SFF booktubers you should be following Find your next favourite read on YouTube! IMO, Guy Gavriel Kay (and a few others on your list) are not Historical Fantasy. They are HF-adjacent but not purely Historical Fantasy. The Temeraire series by Naomi Novik surely deserves a mention. Dragons, galleons, the Napoleonic war, what’s not to love?